I found an interesting page regarding Ariel Baleli. Interestingly, from the page link it appears as thought it was meant for a lock smith. But the content of the page appears to be advertising a company called localwms.com. They appear to be advertising their services to help companies counter negative reviews by posting their own positive blog posts and press releases which make the company look better. This [countering negative reviews] can be done through press releases, blog posts and articles that portray your company or website in a positive light. Would you want to do business with someone that does that? I’ve taken a screen shot of the page just in case it gets removed. Over the last two days and continuing right now, this site has basically been under a spam attack. As of right now there are over 1600 spam posts submitted to this site in the last 2 days or so. Normally, if i get one spam post a week, that would be a lot. Is Ariel Baleli or someone else from Everlast Construction behind this? I don’t know, although I certainly wouldn’t be surprised if he is. I had several blogs over the years, this one being the newest one. And this is the ONLY blog I’ve had that has ever been flooded with spam like this. Fortunately for me this doesn’t matter since i have effective filters in place that have caught all the spam and it doesn’t cause me any problems at all. I can only hope if Everlast is behind this that they at least spent a lot of money to do it, since it would be a waste of money. So I’ve had a few people contact me recently saying everlast construction is still engaging in their dishonest business practices. There are a few things you can try doing. They hate it when anyone brings public attention to their work, so posting honest reviews about them on yelp, home advisor, angies list, buildzoom or any other place where they have reviews. Everlast posts fake reviews on most of these sites so any honest reviews will help. Contact the Contractors State License Board and file a complaint. You can email Thomas Jager at thomas.jager@cslb.ca.gov. He’s the investigator who handled my case. Try and do all communication with Everlast through email or txt messages, that way you have a record of everything that was said. If everlast threatens you with legal action, don’t immediately assume they have the upper hand. They seem to like to depend on people being ignorant of the law and using that to scare people. I would get a short consult with a lawyer – many will give you 30 minutes for free. Or at the very least do some research of your own. Sometimes it takes a while, but you can have an impact. Everlast used to be Diamond certified, and now they are not. If everlast did a poor job, I encourage you to file a complaint with the CSLB. The one shred of hope I had was that maybe they’d eventually clean up their act. But the last few people who have contacted me makes it seem as though that will never happen. So if you hired them to do some work for you and you feel like they did a poor job, contact the Contractors State License Board and file a complaint. I filed a complaint and not much came of it, but they said they do keep all complaints on file so maybe if they get enough complaints, they’ll actually do something useful, like revoke their license. 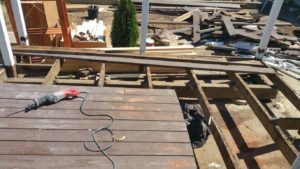 When I created this site and made the initial post, I mentioned that the guy they hired to build the deck had his license suspended. Everlast Construction’s lawyer sent me a cease and desist letter claiming I’m defaming them and part of their claim is that ABA Construction, the one they hired to build the deck, did not have his license suspended. It just hasn’t been renewed. Which is technically correct. What they didn’t mention in their cease and desist letter is that ABA wasn’t allowed to renew their license due to an outstanding bond payment. And now as of the date of this posting, ABA also has a citation against them as well dealing with workers comp. If you look at Ariel Baleli’s linkedin profile you might notice something a little bit odd for someone who is the CEO of a construction company AND someone who is mentioned in many reviews as providing excellent personal construction and design advice – he has virtually no construction experience. ALL of his top skills deal with marketing. Any skills dealing with construction are ALL on the bottom. How is it that someone who is the CEO of a construction company; someone who is mentioned in multiple reviews as providing personal advice and design, has construction as his weakest skills?